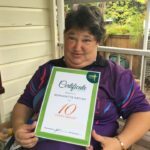 We are very excited to share that Bernie, one of Therapy Pro’s very first clients, was surprised with an appreciation award at the school assembly for 10 years of working in the after school care program. This is a great achievement award for a wonderful person. From everyone here at Therapy Pro and especially Rachel, Bernie’s therapist, a huge congratulations on your award Bernie. Therapy Pro is a registered NDIS provider of therapy services and is committed to providing exceptional, client-centred, outcomes-focused therapy to people with disabilities. We work with you to strengthen your capacity and achieve your goals. Please feel free to call Therapy Pro on 1300 004 414 or email info@therapypro.com.au with any questions or for further information.